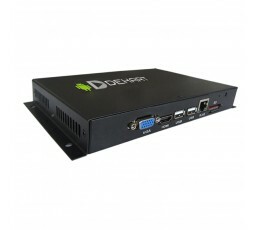 DSPLAYER Digital Signage Network Players with Internet WIFI and 3G support. Manage advertising monitors from office! 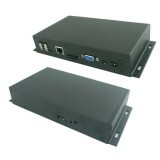 Buy Network Digital Signage players at low price here! 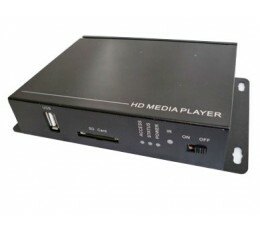 Network media player for Digital Signage is a special device for displaying advertisements and information on advertising and information displays with the function of remote updating and management of information on the Internet. Network signage players are made to create a large network of geographically distributed digital signage displays with centralized management of advertising and informational data. It is convenient to control the advertising in chain stores and supermarkets, pharmacies, banks, service centers, travel agencies, with Digital Signage player. It is widely used in entertainment industry - cinemas, bowling, bars, cafes, restaurants. It is the most demanded service for information support of hypermarkets and large chain stores. 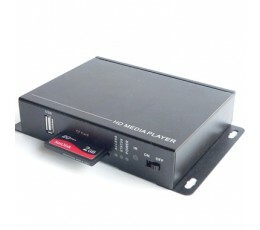 Media player with network control is a box without a screen, it have multiple inputs and outputs. Therefore, we also provide our customers with LCD displays and screens of various sizes in our catalog. Key features of network advertising player are: remote control of ad content from your computer, connection via Internet, Ethernet or 3G/4G. Automatically turn on and display advertising when the power is connected, self-restart in case of power failure, dust and water droplets resistance, not mechanical breaks because there is no coolers and other moving parts, low power consumption, minimal heat emission, can work round the clock 365 days a year. Digital Signage player is a compact device with an embedded microprocessor, a memory block and a set of interfaces. It serves as the source of video and audio for TV near which it is placed. However, its functions are not limited to output digital content to the screen. Network media player have functional and technological means of interaction signage with the target audience. Quick update of promotional and informational video provides the ability to manage large networks advertising players, grouped remotely, using one main computer. Multiple interfaces - AV, VGA, HDMI - are used to connect players to the monitors. Digital Signage player with network features can display multiple messages simultaneously - videos and slideshows in various formats, weather forecast, time, currency rates, news Ticker with news, and so on. Digital Signage players with remote management are often used to display schedules at airports and railway stations, in transportation - for displaying the bus or train on the route, and in advertisements in the form of displaying digital content on an electronic posters, advertising LED displays, televisions and screens in public places. Installation of Digital Signage advertising player with network management enables you to save money on communications equipment for displays, and to make your ad system more flexible. In addition to standard functions of advertising player, network media players allow you to display advertisements to certain times of day, to update the playlist and news on a schedule, promptly withdraw urgent messages to the population, to automatically restore playing of the playlist after a power failure, to continue the program from where it stopped or off, adjust the volume depending on the time of day, to keep statistics show videos with possibility of this report. Network advertising players make it possible to quickly update or change the playlist. You can easily update all media- video, graphics, and music files on all players using one host computer, as if on command of the operator, and according to a predetermined schedule. Most digital signage systems supports simultaneous demonstration of videos, images and scrolling text line on single screen. Thus, it is easy to combine ad displaying with the display of the weather forecast, currency exchange rates, funny animations. Best digital signage players with network support show pop-up banners, drawing attention to the products and promotions. Network advertising media players make it possible to broadcast any public web content from RSS. This allows you to automatically update advertising display information about weather, sports, currency exchange rates in real-time. HTML compatibility makes it possible to display both local public web pages containing updated information, for example, the flight schedule or an electronic queue. Management software allows you to track the status of all media players in real time. Many digital signage media players for transport can connect to the GPS receiver for displaying geo tagged advertising and sending position data of current transport on the map. You can check location and status of media player in program control on the host PC. Software can generate reports on each node, as by the operator's command or automatically at a specified time.